The Rotary Club of Chiangmai West had a very interesting visitor, Romel Saulog Lacson, who was eager to pass on his message to help fight tuberculosis. 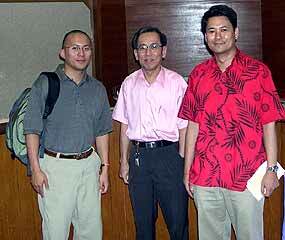 After the weekly Rotary meeting (from left) Romel Saulog Lacson, Rotarian PP Tinnkorn and Rotarian Rajan. Romel works for the Centers for Disease Control in Atlanta and started the Amaya-Lacson TB Photovoice Project to help people with TB to articulate what is working and not working in their fight. He has a personal reason too. Romel’s wife and unborn child died of TB meningitis in August 2004. He is touring the North of Thailand at the moment, raising awareness of TB, training local people to facilitate workshops with members of the community. These workshops include TB experienced people taking pictures of their daily lives and talking with others about possible ways to improve diagnosis, treatment and other factors associated with TB. This is called Photovoice, first developed by Dr. Caroline Wang at the University of Michigan and now used worldwide. People are still dying from TB. Why? A personal plea. Why are we still using the same drugs to treat TB as we did almost 40 years ago? Why isn’t there enough money to eliminate TB from the world today? Let me tell you why I raise these issues. Almost a year ago, tuberculosis (TB) took the lives of my pregnant wife, Claudia, of eight years and my daughter, Emma, of twenty weeks. We thought we would be celebrating the happiest moment of our lives, not the most tragic. In the middle of her pregnancy, Claudia became very ill. Eventually she was diagnosed with TB, but it was too late to save her. Claudia lived her life on earth with hope, passion and love. And above all, the greatest of these was her love. You probably wouldn’t think TB would hit our family. Claudia was a public health professional who spent her career improving the lives of the poor and indigent, including those suffering from TB. And, I am a former behavioral scientist working in HIV/AIDS prevention with the Centers for Disease Control and Prevention in Atlanta, GA USA. How could this happen to us? TB is not selective of its host and because of a particularly latent form of the disease, it affects many more people that we think it does. Globally, TB is the number one killer of women during childbearing years. It is the number one killer of AIDS patients. It disproportionately affects minorities in the US and elsewhere. Most people think tuberculosis is a disease of the past. The hard fact is that TB is here and has always been here. It has never disappeared, it has never been eradicated and it is killing people every day. The CDC affirms that TB is still a major public health concern in the US. How about in other countries like Thailand. It is time we end our neglect of this disease. Here’s what you should know: Tuberculosis is an important public health problem in Thailand. A report from the Ministry of Public Health in Thailand indicated that annually approximately 85,000 persons develop the disease and it is estimated that 7000 deaths annually are attributed to TB. The AIDS epidemic has made the TB situation even more serious. There are approximately 570,000 persons living with HIV/AIDS in Thailand. There is a significant proportion of persons living with HIV/AIDS who are co-infected with TB. The average in the country is about 7 percent or over 30,000 persons and in some regions of the country the percentage goes up to 30 percent. Furthermore in Thailand, there is an alarming rising incidence of drug resistance in the bacteria isolated from HIV infected persons. This will make TB control in Thailand a more complex task if drug-resistant TB spreads to the general population. TB has not, in any way, been eradicated. Globally, a human being dies from TB every 15 seconds. Furthermore, each year 9 million people around the world become sick with TB. More than two-thirds of persons living with TB do not receive full and proper treatment. Did you know that the last new drug for TB was introduced over 40 years ago? The drugs we use today are “behind the times” because they take too long to work or are too complex. When Claudia was in the hospital, she was averaging 14-15 pills a day. According to the Global Alliance for TB Drug Development, this issue is important to understand because when TB strikes, it usually does so during the prime years of a person’s life. Most people living with TB have to stop working. Therefore, a more rapid and simple treatment for TB would not only prevent millions of deaths but could also cut health care costs. At the same time, new drug treatment would help people living with the disease lead productive lives. * Advocate for pro-poor policies in TB control programs- connect development, sustainable financing and the right to health. * Finally, tell them that deaths due to TB in Thailand are simply unacceptable. Claudia and Emma did not have to die from this disease and neither should anyone close to you. Traditionally ‘Black Friday’ bodes misfortune, but Friday May 13 was a very fortunate day for Zonta International. Their first charter president, SomBoon Suprasert was presented with a cheque for 50,000 baht from Peter Dawson, secretary of the Chiang Mai Schools Cricket Alliance (CMSCA). 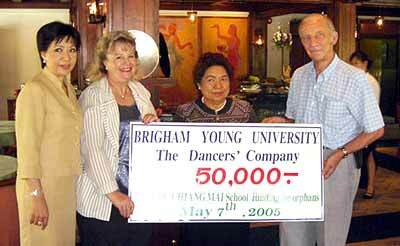 Thanks to ML Preeyapun Sridhavat of the Chiangmai Ballet Academy, CMSCA and Zonta had the opportunity of arranging the recent Brigham Young Dancers tour, to raise money for their special charities. Zonta Internationals’ president, Hope Watcharapreecha, past president, Margaret Bhadungzong and SomBoon Suprasert had decided they would like their proceeds to go to the Zonta Orphanage Child by AIDS Impact charity. Zonta International members had very kindly provided the transport for the American guests to travel to Prem International School, also providing flowers for the performers. Members of CMSCA and Zonta agreed that the event was a success and are looking forward to the next project. Scene from the Austrian movie “On the Other Side of the Bridge”. The European Union Film festival brings to Chiang Mai some of the best motion pictures to come from Europe in the past few years. English language sub-titles are used in this multi-cultural exercise. The following synopses show the standard of films that will be shown. Many are multiple award winners, including the famous Cannes Film Festival. Vienna, 1931. A young Austrian lady falls in love with a Chinese policeman. Against the will of her parents, she follows him to Shanghai where they get married. After initial happiness, their love is challenged by cultural differences and, above all, the political turmoil that engulfs China. Olivier, an instructor at a vocational training center for troubled boys, has his world turned upside down with the arrival of Francis, a mysterious 16 year old. Olivier becomes obsessed, stalking the boy, furtively, while struggling to maintain a professional distance in his presence. As the secret that bonds Olivier to Francis is revealed, Olivier is thrown further into a conflicted world in which he is forced to take a journey of profound emotional and moral complexity. Many well-wishers joined Khunying Chao Dararat na Lamphun and Khunying Bupphan Nimmanhaemindha last Sunday, May 15, when Chiang Mai Governor Suwat Tantipat presented the Ceremonial Certificates which show that both these outstanding women were promoted by His Royal Highness King Bhumibol Adulyadej for their unending services to the Chiang Mai community. Chiangmai Governor Suwat Tantipat handing over a bouquet of flowers with the ceremonial certificate of promotion to Khunying Bupphan Nimmanhaemindha. 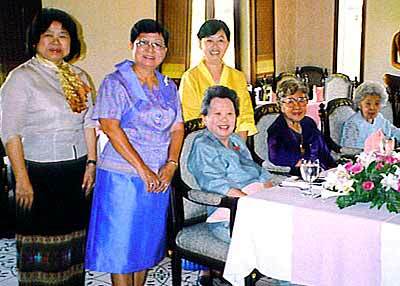 Khunying Chao Dararat na Lamphun is well known as the driving force behind the Girl Guides Association in Chiang Mai. She is promoted from third to second class. Khunying Bupphan Nimmanhaemindha’s family name is known all over Thailand, not just in Chiang Mai, and her immediate family and children, and grandchildren are now substantial figures in their own right, covering many fields of endeavors. 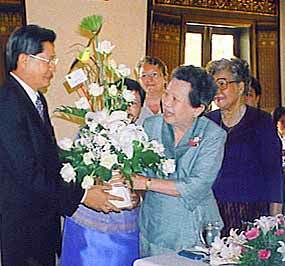 At 83 years of age, she is promoted from fourth to third class for a lifetime of service to Thai people. She is, or has been, president of several prominent organizations such as the New Life Foundation, under the patronage of H.R.H. The Princess Mother. Khunying surrounded by well-wishers and friends (from left, seated) Khunying Bupphan Nimmanhaemindha, president; Man Tada Khunsukmengrai, Ajarn Kengkaan Kosalakorn, (standing) Jermjitt Boonsom of GD-1 Boonsom Farm, Ajarn Pattanut Chananont, committee member, Aom.